This lovely mushroom stamp from Lindsay Mason Designs was embossed in white. 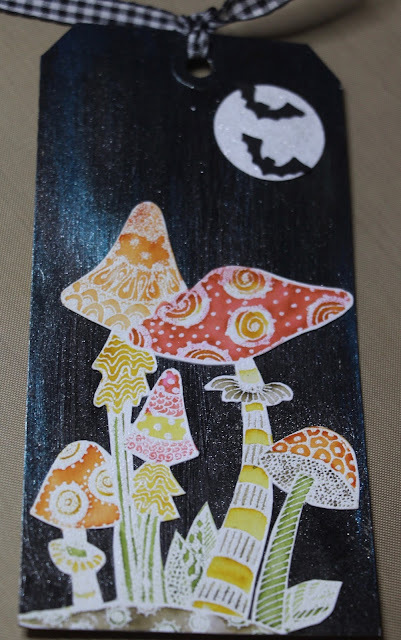 When I stamped it in black ink, the image was much too dark. I wanted it to look luminescent in the moonlight. Embossing in white made it appear to shine and allowed the Distress Pens I used to colour it, to pop more than when I tried this with black ink. The moon is covered in bright white glitter and the little bats were cut using the Brother scan and cut. 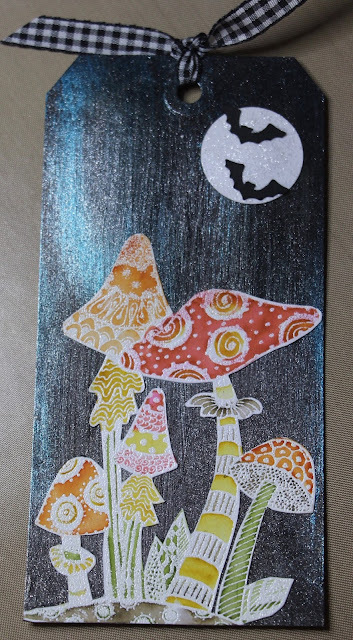 What really makes this ping is the white of the moon and mushrooms against that jet black sparkling night time background which worked better than I had hoped it would. I added a streak of blue in the top left hand side of the tag too. When you move the tag it gleams and I sacrificed photo quality to try and show you that. These very lovely paints are part of the starlight range from Imagination Crafts and take me well outside my matt finish, chalk effect comfort zone! I'm not a shiny, glittery person but I do like a sparkle to catch your eye sometimes. It livens up cards and tags especially.